The Cosmic Cube must be the world's trickiest Rubix Cube - ol' Red Skull has been trying to figure the thing out for 70 odd years! Of all the Joe Bloggs (and the odd Josephine) who have rendered his dictator loving visage, here thanks to much 'rock-paper-scissors' action, are my picks for The Best 6 Red Skull Artists Ever (up until now). 6) Andy Kubert During his Captain America run with Mark Waid, Andy managed to show all sides of the Skull, even some remotely human! 5) Dave Johnson Originally this spot was going to John Romita Snr, but with a style that blends the best of Romita and Kirby, adding a pile of pulp in the process, it was hard to turn Dave away. 4) Jack Kirby Red Skull is Cap's biggest villain, Jack's Cap is comic book gold. Explains itself huh? 3) Steve McNiven When writer Mark Millar had the Red Skull rule the world in Old Man Logan, he needed an artist that could make him look like a world beating force. McNiven sure qualified. 2) Gabrielle Del'Otto Just because the Skull wields the reality shattering Cosmic Cube doesn't mean the former Nazi is afraid of getting his hands dirty. From the sick grin, to one hell of a knife Gabrielle pulls that aspect out in spades. 1) Steve Epting For a guy who has drawn The Avengers and Aquaman, Steve has an untouched knack for handling the classic rouges of Marvel. Galactus and Dr Doom are currently having his wicked touch applied in the pages of The Fantastic Four, but prior to that the Skull had him all to himself over in Captain America. When Epting steps it up a gear and shifts from pencils to paints (even without the big massive sleeper robot), no one even comes close. 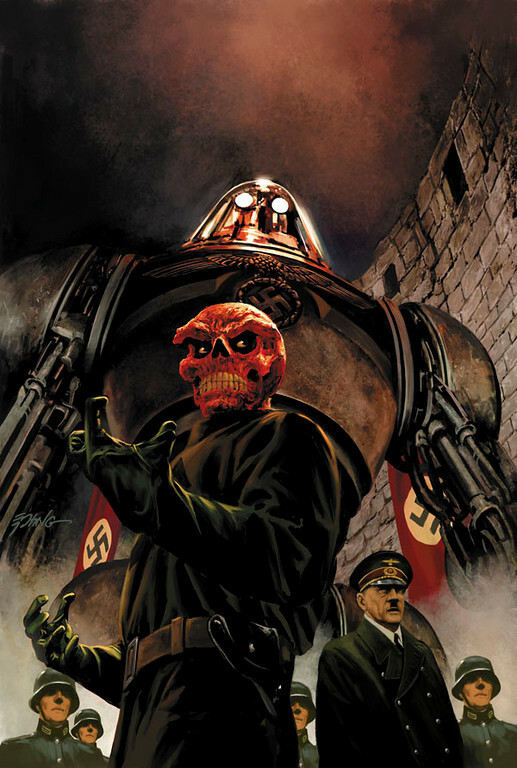 Who is your favourite Red Skull artist? Great list Dan i agree on all the artists mentioned and I must say that is some scary Red Skulls. Yes, Epting's Red Skull is perfect - amazing balance of pulp absurdity, horror and realism. There is a panel in, I think, Death of Captain America story where Lukin puts the mask andthe way he stretches it we clearly see that it is rubber, but it does not release the tension even a bit. Thanks guys! I agree Aaron - especially Gabrielle's version - that's pretty Hannibal Lector-ish right there! @Mighty Plane I remember that scene too! Also in Ed Brubaker's Captain America #1 I remember pausing seeing Epting's Red Skull and just having one of those 'This is how the dude should be drawn' moments. Thanks for the comments and welcome to IADW Mighty Plane! that panel of Red Skull in that Casablanca like dance scene is fantastic from a conceptual stand point as well as the art. by the way Dan your latest crazy cool cover with Waller as the Exorcist in JLA #27 is also pretty cool. that's an ingenious cover concept you were wise to use it my friend. Dave, it reminded me of that 40's era looking piece with the Joker in tie and tails dancing with Harley. Just great stuff. and that Gabrielle piece reminds me of the uncle from Hellraiser, like that skull isn't a mask but raw, exposed muscle. I can picture him wiping his forehead with an increasingly blood-soaked white handkerchief. Just amazing imagery. Dave while that issue was part of what made Mark Waid reportedly leave the title, the flashback issue on how the Skull grew up in Nazi Germany was a pretty decent read, and like you say it made such a powerful image. I thought that same thing too Craig - like Joker in Tim Burton's Batman - mopping his brow and exposing the white skin underneath... really creepy stuff. As for the cover Dave - well I guess that it was just divine inspiration! 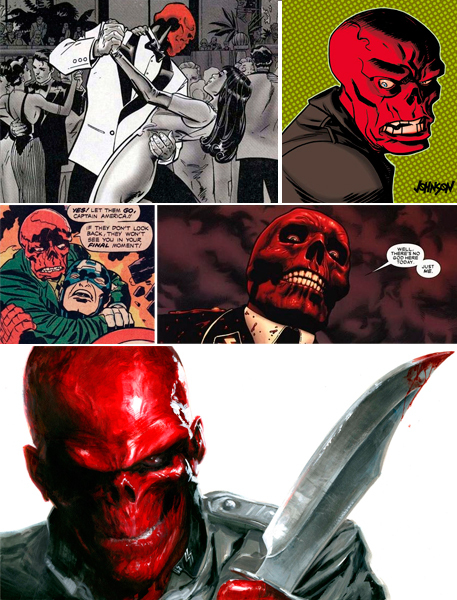 crickey, i knew that Red Skull panel reminded me of something else as well! thanks Craig. Great minds and all Dave. Hanging out with you two is like having a conversation with my brothers. We just get it, sometimes when nobody else knows what the hell we're talking about. Dan, good call. Best subtle little scene from that movie. I know it's no Dark Knight, but that movie still holds up. Even despite its dated '80's soundtrack. Joker: "Really? I thought I was a Pisces"